The largest convention in the Southeast celebrating the impact, contributions, and presence of the African Diaspora in *REALMS OF IMAGINATION through the popular arts. So what exactly is ONYXCON? Similar events that inspired ONYXCON continue to have success. Established festivals like Philadelphia’s East Coast Black Age of Comics Convention (ECBACC) founded by Yumy Odom inspired this event. The original - The Black Age of Comics Convention founded in 1993 by Artist/Educator Mr. Turtel ONLI of Chicago, IL, was the 1st Black Age convention. Inspired ECBACC and many other conventions making ONLI the "Father of The Black Age of Comics"! Others that added to the movement include The Motor City Black Age of Comics (Detroit, MI) founded by Andre Batts/Urban Style Comics, The Kids Comicon ( Bronx, NY ) founded by Alex Simmons. 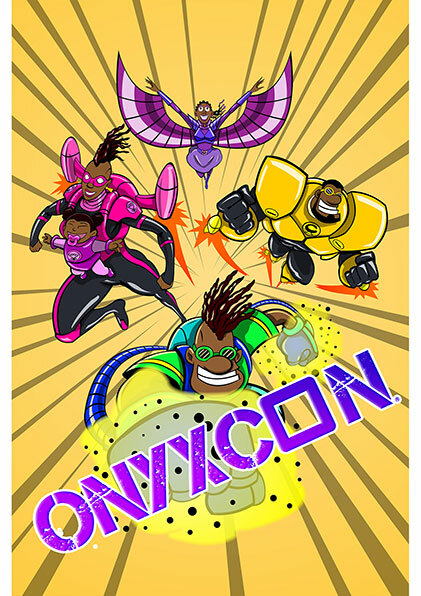 These conventions, The National Black Arts Festival and numerous other ‘comic cons’ were inspirational catalyst for the creation of ONYXCON. Atlanta is the capital of new growth and commerce in the south. Culturally and economically, Atlanta has a strong African American and International African Diaspora community. Many African Americans and other ethnicities/cultures that support the communities have a vested interest in products created for and by people of direct African decent. ONYXCON will create awareness, a new market base, and educational opportunities for consumers and industry professionals who produce unique Art and products for these supporters.